"A pale, anorexic young woman who had hair as short as fuse, and a pierced nose and eyebrows. She did not in fact have an eating disorder. She had a wide mouth, a small nose, and high cheekbones that gave her an almost Asian look. Sometimes she wore black lipstick, and in spite of the tattoos and the pierced nose and eyebrows she was ... well ... attractive. It was inexplicable." ~ Stieg Larsson. This is my attempt at recreating Rooney Mara's Lisbeth Salander look in The Girl With The Dragon Tattoo. About the character: Lisbeth Salander is a world class computer hacker (under the name 'Wasp')with a Eidetic/Photographic memory. A survivor of a traumatic childhood, Salander is highly introverted, asocial and has difficulty connecting to people and making friends. She is particularly hostile to men who abuse women, and takes special pleasure in exposing and punishing them. Rimmel Stay Matte Foundation in Light Porcelain #010. I picked this pale shade just for this look. This foundation is really very matte. Brown e/s to contour nose. I made it look shorter and flatter. Used same e/s to contour under cheekbones. Eyes: I used 3 eyeshadows from Sleek Oh So Special Palette. Matte reddish brown & brown e/s -Wrapped & Boxed - on my crease and lower lash line & Black e/s Noir to smudge outer half of lower lash line. Rimmel black Kohl to tightline upper lash line. Lips: I applied Maybelline Baby Lips Hydrate, blotted it, then concealed edges with Bourjois Happy Light Concealer #21 and then dabbed a very tiny amount of Revlon Va Va Violet Lipstick on the center of lips to give them a little bit of life. Hair: I just tied my hair in a high ponytail, then I clipped the Fringe at the crown, higher up so it looks short. Clip on nose rings from Ebay. You simply push the round thingy and they open. | Eyebrow ring is an earring. I looked and looked for stick on eyebrow barbells or chain. I was this close to cutting the silver balls from the drain blocker in out bathtub...hehe. I do have a necklace with silver balls that I could cut, but it's in India. Sometimes we forget that there are women who have a different idea of "PRETTY", who feel beautiful dressing up in a way that's different, who don't want to look like a doll, who don't try to squeeze themselves into that unwelcoming man-made box of "PERFECTION". There's just something so carefree & honest about that. I think the movie did full justice to the book. I choked up and wanted to cry during that scene. This is hands down your best look EVER! We see so many conventioanl pretty looks,but looks like this are what makes us realize just how transforming makeup can be. you need to do more looks like these.You could be the Promise Phan of India..Transformation wise..! Thanks Fathima! Lovely compliment, coz Promise is super talented! This is flawless. You've done it beautifully. It's one of my favourite books and makes me cry/gasp everytime I read it. okay. best ever. you nailed it. especially the eyes. Suuupeeeeer Taanted you are !!! and this girl with the dragon tattoo inspired look is awesome! Your so talented Cynthia and always entertain us in these amazing looks of yours :D.
your doing pretty off the track looks these days Cynthia ..your just awesome :)!!! You look so much like Rooney Mara looks in the movie! I remember tearing up when I saw the movie and thinking it did so much justice to the book. We can say that of very few movies based on book. Lis Sanders, it is! Great job! 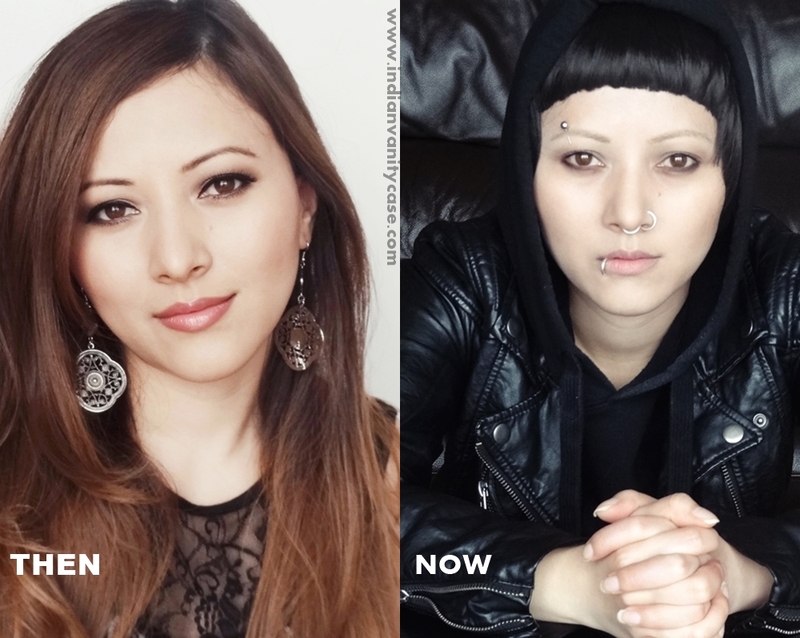 Cannot believe a beautiful CZ could do wonders with makeup to make that transformation happen on herself. Wow, it's right smack awesome! You're totally rocking this look. CZ you are simply mindblowing! There's an Adjective Called Unique and Not Everyone Is Blessed To Live With It.. I Had a Real Tough Time Finishing That Book..
...and now I know that it's okay to stick with your personal style. To h*ll with haters. I've never changed into a clone of "fashionable" girls, but I used to feel bad about it. Not anymore!! Thank you, CZ! Love you! Congratulations! You're a beauty does't matter the look you recreate. Kisses! You are an absolute rockstar! wow....thats an awesome transformation!!! hats off to u!! I love that you took the notion of conventional prettiness and threw it out of the window and had the courage to do something out of the box. It is exactly this kind of a post that sets your blog apart from the rest. This look was like a breath of fresh air.